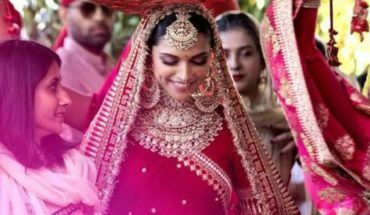 It was a time when lehenga are only worn by North Indian bride, but today all brides want to wear lehenga for their wedding reception. But something stops them from buying it! what is that? 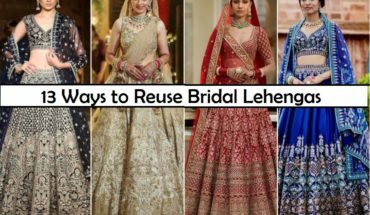 ‘is it worth investing as I won’t be able to wear it again’ or ‘ how can I wear the lehenga dupatta in different styles to reuse it again’! 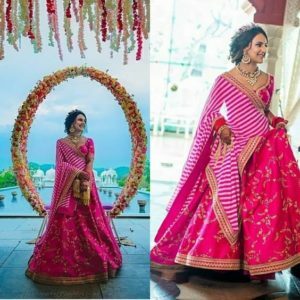 This article is all about that, Yes, here I have listed some unique style of dupatta draping style that you can implement on your lehenga after reading the article. 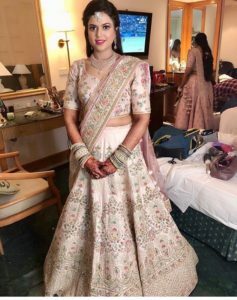 Also for brides out there, get out from the old style of dupatta draping for lehenga and try this style to stand unique in your big day. Standard saree draping style with a pleated single dupatta on one side of the shoulder. 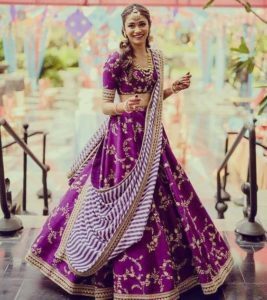 This style of draping gives a complete transformation to the outfit and gives more of a saree outlook than more of a lehenga. So, indeed you can get two styles in one outfit. If your lehenga is heavy worked and your dupatta is designed simply then you can go out for this style. Pin one side of the dupatta at the back of your waist and bring the other end to the front from the right shoulder without pleating. If you have double dupatta for your lehenga then you can use it at the best like the above image. Drape one dupatta like the usual saree style and use the other one to cover your head. 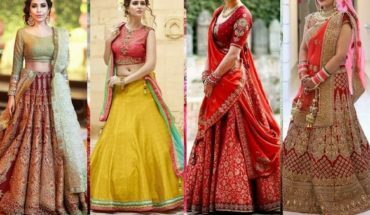 This is the best style for bridal lehenga dupattas. 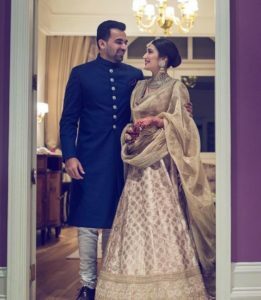 If you are looking for a modern look in your traditional outfit then this is the one! Simply tuck your dupatta from the left side of your waist and bring to your right arm from backward. 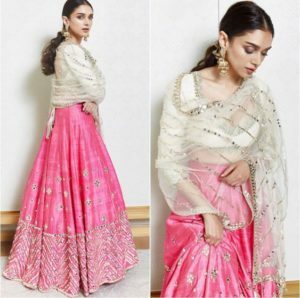 When both your lehenga and dupatta are heavy embroidered then you can simply make your dupatta float on any of your shoulders. This will also be easy to carry yourself comfortably. Wrap the dupatta in your arms, this is another way to make an easy style though! grab the dupatta from the backward and wrap it in your arms. 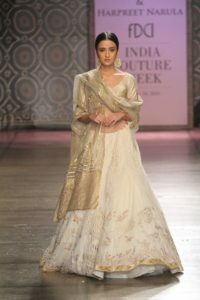 Some lehenga dupatta would be longer than usual at that times, you can drape it as saree and use it to cover your head. Yet a simple choice! This might be the oldest style yet most liked styled by all! This style goes well if your dupatta has a beautiful border design. This style is most preferred during Mehendi ceremonies to keep themselves free. Some lehenga comes with self-color dupatta at that time, you can simply pleat it and make it look like one. If your dupattas are sheer type then you can try this. Drape one dupatta from right shoulder with pleats and pin the other end in the left of the waist. Make the other dupatta to cover your head. If you want to handle your dupatta in a cooler way then try out this style. Just make it float on your shoulder from the back. To add essence to your normal saree style dupatta draping you can go for waistbelt. This will be give an aesthetic look to your outfit. It is not that you really need to pin the dupatta all the time. If you are performing any rituals you can style it in this way of wrapping it around your chest. Shorter pleat length is old style, going for a long length is a new style. Make your front pleat length long to your knee this will give a cool look though. 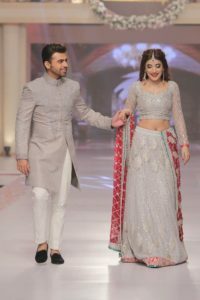 If you are going to be a bridesmaid and looking for a different style of dupatta draping style then you can try out this style. If you are someone who likes to experiment with new styles then you should definitely go for it! If you want something unusual then try out this! pin the pleated dupatta in the left shoulder and bring it to the front bottom in a ‘U’ shape. This will definitely make a different look. 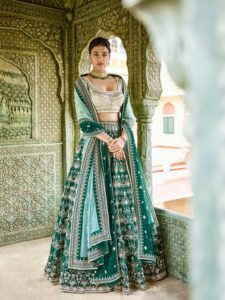 This style looks great when styled with extremely heavy work lehengas, as this will give you a gorgeous look for the wedding ceremonies. Hope you all enjoyed reading this article, try out this dupatta draping style for your lehengas and comment your favorite style below.